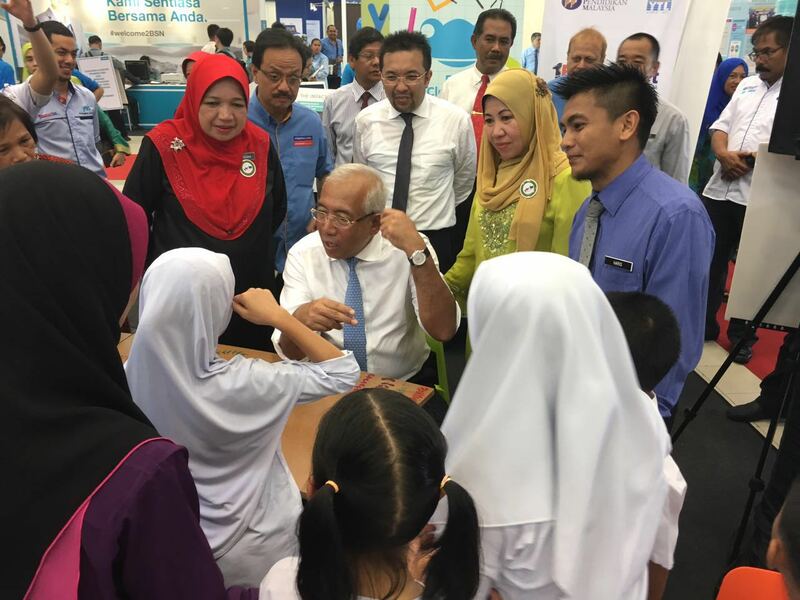 Dato' Seri Mahdzir Khalid, Minister of Education, communicating to the children of SK Pendidikan Khas using sign language. These students were at our Frog Classroom to show us how they use the Frog VLE for a Mathematics lesson. Happy Teachers Day, Malaysia! While our team in Kuala Lumpur is spreading the news on the wonderful 21st century teachers who will be receiving the 1BestariNet Teachers Awards, we're celebrating in Kota Kinabalu with some very special friends of ours, SK Pendidikan Khas. Dato' Seri Mahdzir Khalid, Minister of Education, writing a special #thankyoucikgu postcard for Teachers' Day at our Frog Classroom. Both Dato' Seri Mahadzir Khalid, Minister of Education and Tan Sri Dr Madinah Mohamed, Secretary General Ministry of Education stopped by our booth to meet the teachers and students of SK Pendidikan Khas, a special needs school for students who are hard of hearing. They were at our Frog Classroom to show us how they do a Mathematics lesson on the Frog VLE. Tan Sri Dr Madinah Mohamed, Secretary General Ministry of Education signing a Frog Classroom table in Sabah today. Looking on are En Md Noradli and Tn Hj Shahirul Amran of YTL Communications and En Haris Abas of SK Pendidikan Khas. This is En Haris Abas and Pn Nurmegawaty with the students of SK Pendidikan Khas. You might remember their story from our very first Lilypad. One of the reasons we're so excited to be here in Sabah for Teachers' Day is because we get to meet some old friends! It is good to see En Haris again. He shares that the school is doing well, with a few changes to business-as-usual. The orientation of the computers in the school's computer lab which used to be in rows, is now in two islands of four, which helps teachers moves around the eight PCs. Also new is that En Haris has a change of post. He now teaches Standard 3, when he previously taught Standard 4. We asked him about what's different. "Perubahannya adalah lebih dari segi pendekatan. Budak-budak ini belum ke tahap 2, oleh itu belum perlu bersedia untuk UPSR. Saya boleh menggunakan 'games' dan elemen-elemen yang lebih seronok." He explains that not much has changed, except for minor adjustments to his teaching approach. As his students are not yet preparing for UPSR, he can set up simple, fun games for them to play within his lessons. 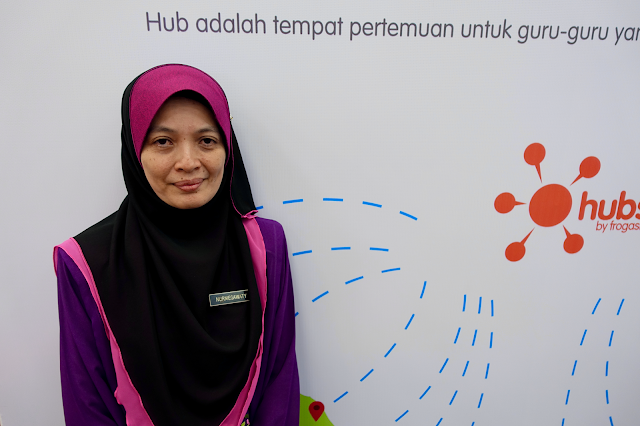 Like En Haris, Pn Nurmegawaty Mohd Tahir did not receive any specific training in teaching for special needs. She does use the Frog VLE in her lessons, thought - for quite different reasons. Her students are preparing for UPSR as she teaches Standard 6. She commented that her students tend to easily forget lessons already taught. "Untuk membuat persediaan untuk UPSR, dulu, saya terpaksa ulang balik apa yang saya ajar dengan setiap pelajar. Sekarang, saya menggunakan Frog VLE membantu pelajar ingat. Ia kurang meletihkan dan pelajar boleh mengulangi latihan pada bila-bila masa." She explains that she used to have to repeat her lesson with each student again and again to enable retention. She finds things easier now, because she can build a Site which helps students repeat the lesson as many times as they might need, and whenever they need to. This young man named Jojoh is very expressive, and is sort of a pack leader among his friends. Confident and excited to be in a cool new space, here he is with a mysterious smile. It has been a colourful and happy time here at Kota Kinabalu for the FrogAsia team. Those of us from the Peninsula will miss seeing our friends from the land below the wind but we leave with such colourful memories. Your love for music and your beautiful smiles will stay with us always. Tengok dari jauh hati saya rindu.